It’s been a while since I’ve found anything decent in the used music shop I frequent in Nagano city, Japan, but today I found nice little ( or big ) gem. 1. The professional weighted 76-note velocity-sensitive keyboard is outstanding. It really feels great to me. 2. The two selectable MIDI Outs, one MIDI In, one MIDI Thru are very much needed with all the hardware sound modules I have. 3. Having the two key zones, Split and Layer modes allows for quick modifications to the keyboard setup. 4. The 32 user patch locations; 32 presets for use with GM/GS sound modules should be useful for custom setups. 5. Dedicated buttons for Octave Up/Down keyboard transposition, +2 octaves is very accessible. Awesome! 6. The A-33 is battery powered, has a Bender/Modulation lever for added expression and a Start/Stop button for sequencer control. 7. There is a Roland A-33 software application to help visually program the keyboard which is nice. I don’t need any computer connectivity as I don’t use one when performing and if I do use the computer I send the audio through a mixer. The newer USB Keyboard controllers are not necessary for me although I do have an Edirol controller should I need that. 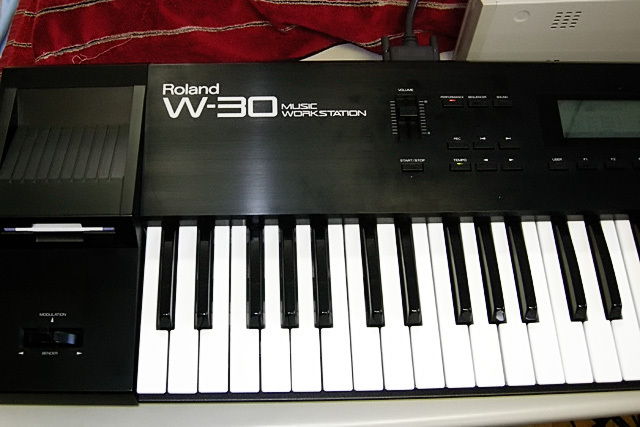 I’m really excited about finding the Roland A-33. It really feels great and when connected to a couple of sound modules, it’s very flexible. It’s a really nice set of keys for just a controller. Update: Here is a list of CONS in case anybody is interested in the negative aspects of the Roland A-33. I pretty much bought this for the 76 keys and the two midi outs. I think for the price and condition, I really couldn’t go wrong with picking one up to try out.